Projects - Jede Stimme e.V. For the first time we want to map innovative civic engagement projects that foster political participation in Berlin, Germany, and Europe in order to boost inter civil society coordination and open debates about democracy and participation in Europe. We want to learn more about your project! Jede Stimme e.V. took part in the city wide protest for more voting rights in the EP Elections 2014. In connection with the EP2014, a referendum was held where EU citizens and third country nationals were equally excluded from the voting process. They make up roughly 13% of the potential electorate in the city area concerned with the referendum. We organized public actions in front of the German parliament in 2013. Neither EU citizens, nor third country nationals residing in Germany for many years can vote in national elections. By setting up a fake voting booth, people could cast their vote to demand their right to participation. 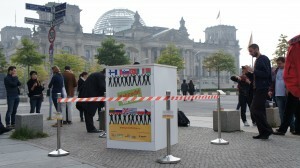 The latest project Protest & Participation continues a journey that has started in 2011 when Citizens For Europe e.V. and Jede Stimme e.V. held symbolic elections for immigrants who couldn’t vote.